York County is home to award-winning public school systems and colleges and universities offering technical education, graduate and undergraduate degrees. Recently ranked as the best public schools in the state, York County’s four public school districts include some of the most highly respected elementary, middle and high schools in South Carolina. Along with K-12 education, York County schools also provide vocational training and adult education. Almost 5,200 students attend York School District's 10 schools. Students attend neighborhood schools before consolidating into York Middle School and York High School, which provide an innovative and real-world experience for students. The district also includes York Intermediate School, which is open to fifth and sixth graders and has been recognized statewide for academic achievement since it opened in 2010, and York One Academy, an alternative school for grades five through twelve. Home to award-winning fine arts and career and technology programs, the Clover School District serves more than 7,500 students and is one of the fastest-growing districts in South Carolina. Programs in district schools include Connected Classroom, a one-to-one education technology program that provides all students with an iPad or MacBook, and School-to-Work, an initiate that links classroom learning with workplace learning to guide students toward meaningful careers. The largest school district in York County, Rock Hill Schools house around 18,000 students in 27 schools and learning campuses that include adult education programs and a technology and career education center. The district’s diverse communities of schools provide a challenging curriculum and programs that range from remedial to International Baccalaureate. Rock Hill Schools are known for their outstanding teachers and their commitment to offering a challenging, relevant and meaningful education to all levels of students. In response to the district’s rapid growth, the Fort Mill School District has undergone an aggressive expansion and renovation program to accommodate more students. The district is known for its tradition of excellence, which has made it the top-performing district in South Carolina based on performance data. The school district’s 16 schools serve more than 15,000 students. Fort Mill schools balance academic achievement with a commitment to arts and athletic programs and a goal of creating well-rounded students. There are 18 private schools in York County, South Carolina, serving over 2,600 students. The majority of the schools hold a religious affiliation with an average student:teacher ratio of 9:1. Private School Review rated York County’s private schools favorable in categories such as exceptional scores in standardized testing (SAT), having numerous advanced placement (AP) class offerings, as well as having a wide variety of sports available for students. They are also noted as some of the most affordable private schools in the nation. Click here for a list of Private Schools within York County. This public institution was founded in 1886 as a teachers' college and continues to be regarded for the quality and value of its education. 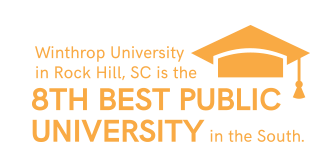 Located in Rock Hill, Winthrop University offers challenging undergraduate, graduate and continuing professional education programs. The school also is home to a successful NCAA Division I athletics program, more than 125 clubs and organizations, and service learning, study abroad and internship opportunities. York Technical College's more than 90 programs include continuing education and degree programs. Classes are held in modern facilities, and the campus in Rock Hill includes a new science and technology building, a library and a child development center. The college offers two-year university transfer programs as well as certificate and degree programs in business, health services, and engineering.